Sun and clouds mixed. High 79F. Winds SSW at 10 to 15 mph..
Cloudy. Low 63F. Winds S at 5 to 10 mph. The members of Kids These Days have some impressive accolades. Kids These Days is a New York City comedy troupe. Kids These Days have two performances in the Charleston Comedy Festival. Kids These Days is a sketch comedy troupe. There are 10 members in Kids These Days, all with different senses of humor. The members of Kids These Days aren't afraid to get silly on stage. The members of Kids These Days perform sketch comedy. Performers and comedy ensembles hailing from near and far are descending on the Lowcountry this month with giggle-inducing one-liners, sketches and improv sets to be delivered at the 16th annual Charleston Comedy Festival. The event runs Jan. 16-19 at a variety of downtown venues, including College of Charleston's Sottile Theatre, Theatre 99, Threshold Repertory Theatre, Woolfe Street Playhouse and The Commodore. One of many groups performing is Kids These Days, a 10-piece comedy troupe out of New York City. The members' resumes include multiple Emmy Awards along with credits and appearances on "The Tonight Show Starring Jimmy Fallon," "The Daily Show with Trevor Noah," "Full Frontal with Samantha Bee," "Funny or Die," "The Opposition with Jordan Klepper," "The PIT" and more. 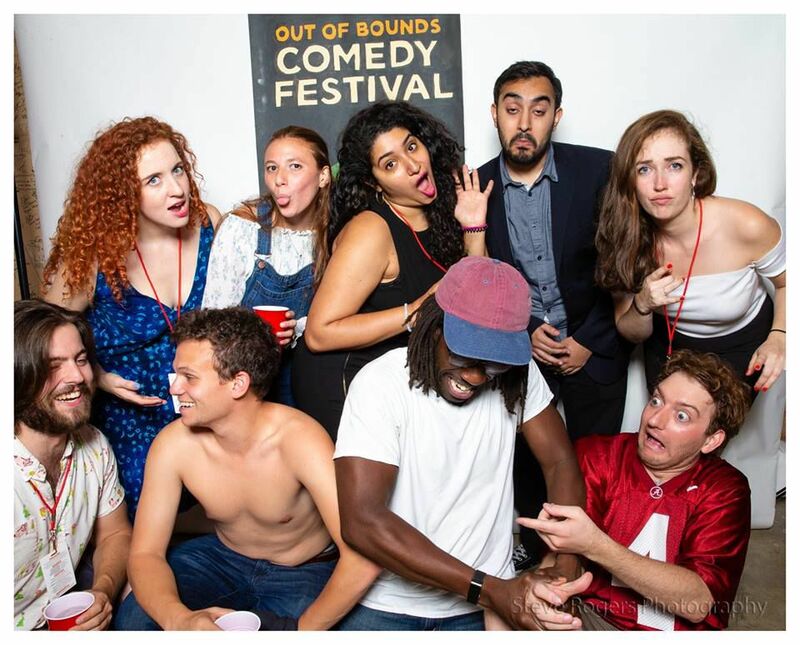 Kids These Days have two performances at Threshold Repertory slotted during the long weekend of comedy, and founder and member Rachael Burke is ready to share her "'Ocean's Eleven' supergroup" that she compiled with Charleston. "There are so many times where you do comedy in a group, but you don't necessarily choose who you're with," Burke says. "I wanted to control that; I wanted to be around inspiring people who would make me better. So, I made it my New Year's resolution last year to form a group that would do just that." She compiled Kids These Days in February from a hodgepodge of people she had crossed paths with. One was a college friend, one person she met at work, one she met in line at a comedy show. Everyone in the group comes from a different state (one is from Canada) and, most importantly to Burke, has a very different sense of humor. It provides a unique variety of comedic styles, ranging from slapstick to political humor to impressions, that resonate across diverse audiences. "Sometimes, you'll go to a show and you'll just have the same type of humor," Burke says. "But we all have a different sense of humor. Comedy comes from observations and life experiences, and we've all had different upbringings." Those differences are appreciated and played up among the members, who come up with individual sketch ideas but then workshop them together to form a more complete narrative. There are compliments, constructive feedback and ultimately deciding what's likely to land and what probably won't. "This group is incredibly supportive and celebrates difference, particularly when said difference is absurd," says Sascha Garrey, another Kids These Days member, writer and performer. "No idea is too weird for our team, and this ethos of anything goes has been key in helping me tap into my voice." These performers are the same people who are working behind-the-scenes on some of the most renowned comedy shows in the world. For example, Burke works on the digital team for "The Tonight Show Starring Jimmy Fallon," and her team has won two Emmys. And while writing sketches for others to perform is one creative outlet, another is performing them yourself — and that comes with more freedom. "I literally have all the freedom in the world to challenge myself with whatever I want," Burke says. "If I want to try a new impression or want to sing an R&B song, I can write it for myself and the only limit is me actually being able to perform it." Member Jack Blankenship, who appears and performs on "The Tonight Show Starring Jimmy Fallon," adds that writing for a troupe is quite different from writing for a solo improv show. "When I write a sketch for Kids These Days, I can craft roles without limitations, because I can bank on the abilities of our immensely skilled performers," he says. It's about camaraderie, but also a genuine passion for making people laugh. For Burke, who began performing comedy bits for her family when she was a kid, her job as a sketch writer and performer is a dream come true. "I love making people happy and improving the quality of life of others, giving people an escape from their troubles and putting more beauty and lightheartedness into the world, which we need," she says. WHERE: Threshold Repertory Theatre, 84 Society St.
MORE INFO: For the full schedule of Charleston Comedy Festival events, visit charlestoncomedyfestival.com.